Fashion has always been part of our lives. Even if we’re not that really into it, we are subconsciously carrying fashion on our everyday lives. Well, it’s not just about clothes. Fashion can also pertain to necklaces, sunglasses, watches and the like. It’s anything that can make you look more stunning and admirable. A person can look as amazing as he or she is with the way she beautifies his or her physical looks. One can’t simply think of a watch without G-Shock in mind. Casio has been successful with this line for over the years. 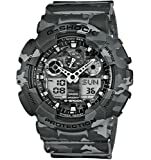 GA 100 can function as both analog and digital watch. 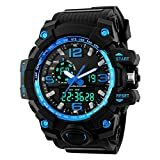 This already has stop watch, alarm and countdown, and water resistant for up to 200m. This is possibly the most casual watch in the industry that can serve anyone well. If you want to stay casual and still be classy at the same time, Civo’s Leather Band Date Calendar Wrist Watch. This analog watch has proven its durability for being waterproof for up to 30m. It is perfect for both indoors and outdoors since it is shock and scratch resistant. You can stay minimalist without losing the style. This watch can help you track your schedule in the most stylish way. Switching over the watches, Megalith’s Face Dual Time Military Tough Watches is the ideal watch that can make any guys manlier and look tough. It may look big but this watch is actually light and comfortable to wear. This watch has 2 time zones. This is ideal for people who travel a lot from his hometown to another. And with its stylish designs, it can be the perfect watch for any outfit. To be fair, this might be one of the coolest sunglasses that were produced. Mini Tree’s Polarized Bamboo Wayfarer Glasses can actually prove that summer may stay forever. It can bring some beachy vibes that would make you want to go out and enjoy the sun. What makes these sunglasses special is the fact that they were carefully handmade. They are 100% bamboo. They are polarized but they are still dark and UV protected. If you’ve seen Trainspotting or T2 then you probably know Spud. He’s the guy who wears sunglasses who looks exactly like Dragon Alliance’s The Jam Sunglasses. The Jam Sunglasses is already UV Protected. It is safer when you are out of the sun. Talking about the style, this sunglasses, derived from the name, can actually make you feel like you are in the jam. Wearing this would make you look cool like you are ready for any groove. 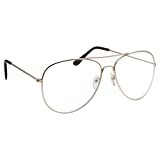 Another pair glasses that may still work with your fun side sense of fashion is GrinderPunch’s Non-Prescription Premium Aviator Clear Lens Glasses. This eyewear is already UV Protected and non-prescription. It is also unisex and great for any gender. This aviator is one of the best accessories to match your OOTD. It has a silicone nose pads so it is actually more comfortable compared to other common frames. If you want to unleash and channel your inner hippie style, incorporate the perfect sunglasses with yourself. 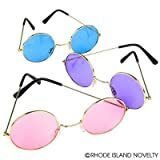 John Lennon Colored Sunglasses will surely bring back the timeless style from his era. Made from different colors, you can actually choose the tint that would work best with your personality. Its round frame may be great for retro parties and costume events but it would still look good even on a simple day. 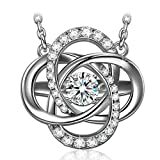 10K White Gold Solitaire Pendant Necklace set with Round Cut Swarovski Zirconia (2 cttw), 18"
If you want to make things simple, 10k Gold Solitaire Swarovski Zirconia Pendant Necklace may be the ideal accessory that you are looking for. It is a rope chain necklace with a gold pendant that features a round Swarovski Zirconia. Classiness is highly visible with this necklace. It has a minimalist design that pops up its sparkling diamond. It’s 10k White Gold is surely enough to make a girl shine among the others. f you are still looking for a perfect gift, we’ve got another necklace for you. Ninasun’s Silk of Love is just as classy as how you want it to be. This necklace kind of resembles Hermione Granger’s time turner except that it is more elegant and sophisticated. It is made of 925 sterling silver with stones from Swarovski cubic zirconia. 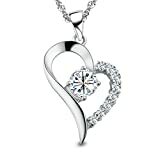 This necklace is ideal for your girl during anniversary and other romantic events. Thinking of a great way to express how loyal you are to your girl? Say no more. Pearl of Dreams’ You Are the Only One in My Heart Sterling Silver Pendant Necklace is the perfect gift for any occasion. The 18-inch chain of this necklace is Singaporean made. Both the chain and the pendant are sterling silver, plated with rhodium. Since it is B-shaped, it is an ideal gift for someone whose name starts with a letter B. With its splendid beauty, You Are The Only One In My Heart Necklace can make anyone who wears it feel like she’s the Belle of the Ball. What you want to say to the receiver will surely be as bright as the stones built with this necklace. The items that are included in the list are just some of our favorite accessories. Picking an item will vary depending on your purpose. Are you going to wear it? During when? Are you choosing an item for a possible gift? For whom? Actually, it’s not easy to pick the perfect accessories based on your needs. As long as you have a clear idea in mind, you’ll easily figure it out.